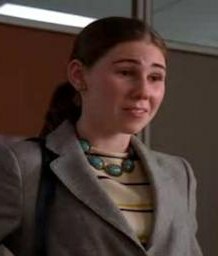 Zosia Russell Mamet is an American actress and musician, who has appeared in television series including Mad Men, United States of Tara and Parenthood and as Shoshanna Shapiro on the HBO original series Girls. Mamet was born in Randolph, Vermont. She is the daughter of American playwright, essayist, screenwriter, and film director David Mamet and actress Lindsay Crouse. Her maternal grandfather was playwright Russel Crouse and her maternal great-grandfather was educator John Erskine. She has a sister, Willa, who is a singer, and two half-siblings, Clara, who is also an actress and director, and Noah. She identifies as Jewish (her father is Jewish and her mother is Buddhist). She lived in New England until age five when her mother moved to Pacific Palisades, California with Willa and Zosia. After finishing high school, Mamet decided to pursue acting instead of going to college. Mamet is married to actor Evan Jonigkeit. The two wed in October 2016.